28-10-2017 Closing ceremony of the World Draughts-64 Championship among men and women took place at 6 pm in the big cinema hall of the hotel “Moscow”. The president of the International Draughts Federation Vladimir Langin, presented the newly-produced signs “International Grandmaster” and “International Master” to the participants, who were awarded these titles since the IDF was created, and also he awarded diplomas players who were awarded IDF titles. 26-10-2017 The players who won their matches in the 1/4 finals and who will play in the 1/2 final were Vladimir Egorov, Igor Mikhalchenko, Andrius Kybartas and Arunas Norvaishas. Tomorrow in the 1/2 finals for 1-4 places will play pairs: Egorov – Mikhalchenko; Kybartas – Norvaishas. Women who won their matches in the 1/4 finals and who will play in the 1/2 final were Zhanna Sarshaeva, Elena Scovitina, Darya Fedarovich, Iuliia Makarenkova. Tomorrow will play pairs: Sarshaeva – Makarenkova; Scovitina – Fedarovich. At 16.00 the participants of the World Championship went on bus tour around St. Petersburg. See photo in section Photo. 25-10-2017 The preliminary stage of the classic program is completed. In men, 10 players scored 11 points and only 8 of them got to the first 8, which will play medals in the classic championship of championship. International grandmasters Sergei Belosheev and Nikolai Gulyaev have the lowest coefficient and will fight for 9-16 places. In women, 3 players scored 11 points and 6 players scored 10 points each. Vera Khvaschinskaia (Belarus) was not included in the first 8 players by the coefficient. She will fight in the second group for 9-16 places. For women with a score of 8 points from 10, Darya Fedorovich (Belarus) is in the lead alone. Zhanna Sarshaeva (Russia), Iuliia Makarenkova and Elena Korotkaia (both Ukraine) have one point less. See current results, games in Section Games and online broadcast in the section Online, publications about the championship in the press and on television in the section Press. Сompetitions were held in 2 stages. 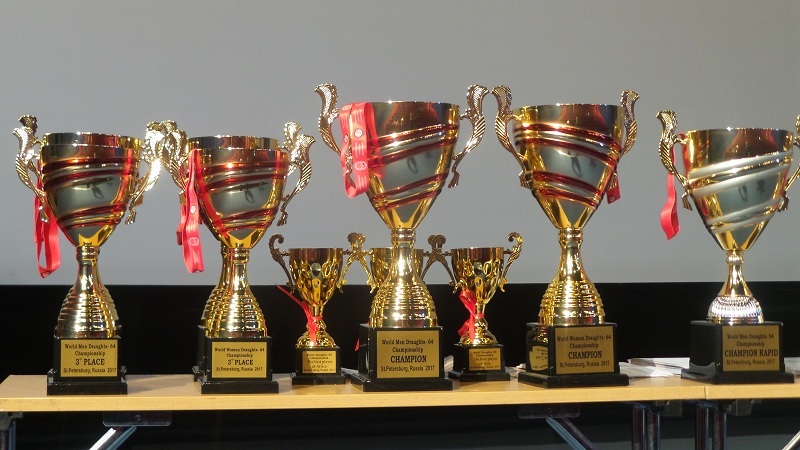 The preliminary stage was held by the Swiss system in 9 rounds in men competition and in 8 rounds in women competition. The four best played medals in the play-offs. Сompetitions were held in 2 stages. The preliminary stage was held by the Swiss system in 9 rounds. The four best played medals in the play-offs. The first participants begin to arrive at the championship. Participants from Uganda, Kazakhstan, Turkmenistan and Jamaica will arrive to St. Petersburg tomorrow. 12-10-2017 The participants and guests of the championship were greeted by the Governor of St. Petersburg Georgy Poltavchenko. The greeting of the governor is published in the Greetings section. In the Press section you can see the first responses in the press about the World Draughts-64 Championship in St. Petersburg. 04-10-2017 Press release of the World Draughts-64 Championship 2017 among men and women. 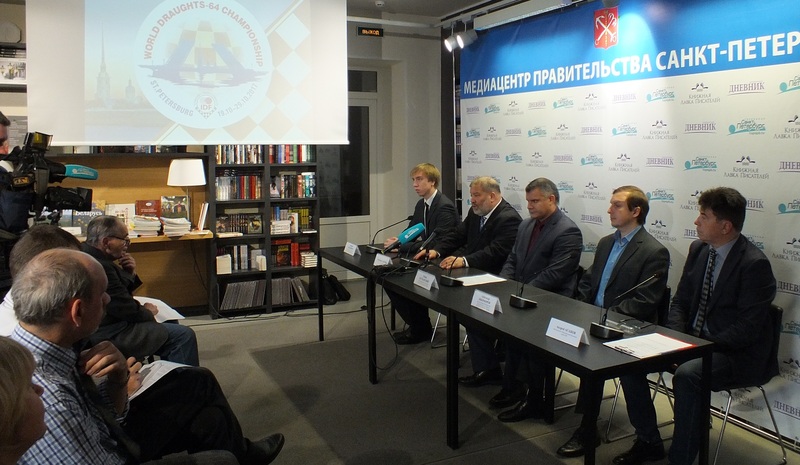 October 19 in St. Petersburg starts the World Draughts-64 Championship among men and women. World Draughts-64 championships have been held since 1985. The 2017 World Championship is a jubilee – the 30th for men and the 15th for women. In recent years, St. Petersburg has become the world center of draughts on the traditional 64-cell board. The city has long-term draughts traditions and a great experience of holding draughts competitions on the highest level, including world championships. World Draughts-64 championships 2011, 2013 and 2015 held at a high level in St. Petersburg, made a great contribution to the history of draughts sport and served as a huge impetus for the development and promotion of draughts on a traditional 64-cell board throughout the world. Draughts-64 became to a new level. Now there are more than 70 countries of the world in the International Draughts Federation (IDF). High-level championships of Europe and Asia, major international tournaments are held regularly. In 2016, the first African championship was held in Zambia, and in 2018 the first championship of Pan America will be held in Jamaica. The World Draughts-64 Championship 2017 will traditionally held in three programs: Blitz, Rapid and Classic. Strongest players of the world from forty five countries, representing 4 continents: Europe, Asia, Africa and America, will take part in the competition. The strongest international grandmasters, the current world champions in different programs Sergey Belosheev (Russia), Igor Mikhalchenko (Belarus) and Arunas Norvaishas (Lithuania) for men, Elena Skovitina (Moldova) and Sofia Morozova (Russia) for women will compete for the medals of the championship. Competitors with them will be Russian players – multiple world champions Gavril Kolesov and Nikolai Struchkov (both from Yakutia); prize-winners of the world and European championships Oleg Dashkov (Samara), Nikolay Gulyaev (Yakutia), Vladimir Egorov (Tula); winners of the World Cup Vladimir Skrabov (Yaroslavl) and Dmitry Tsinman (Kazan) as well as champions and prize-winners of the world championships of different years Andrey Valyuk and Yevgeny Kondrachenko (both Belarus), Ion Dosca (Moldova), Arno Uutma (Estonia), Andrius Kybartas (Lithuania), as well as young but already announced players – champion of Asia 2017 for the Rapid and Blitz Samandar Kalanov (Uzbekistan), winners of major international tournaments Mirat Zhekeev (Kazakhstan), Vilius Alekhnavichius and Domantas Norkus (both Lithuania), Denis Shkatula and Vladislav Mazur (both Ukraine). The opening of the championship is likely to be talented African players – African champion 2016, international grandmaster Richard Mwamba, champions of their countries Bafaki Dan (Uganda), Mambwe Lukanga (Zambia), Juma Madalitso (Malawi) and Tsamba Clifford (Zimbabwe). We are waiting for a confident game from the multiple champion of Brazil, prize-winner of the youth world championships Francisco Marcelo, who showed at the last world championship the best result among players of the American continent, and also from the champion of Jamaica, the legendary Wayne Reid. In women world and European champions Zhanna Sarshaeva (Russia), Julia Makarenkova and Elena Korotkaia (Ukraine), Belarusian players – Daria Fedorovich, Anastasia Barysheva and Vera Khvaschinskaia, prize-winner of Asian championship 2017 Shahzoda Tursunmurotova (Uzbekistan), as well as the winner of the World Cup 2016 and the World Junior Championship 2017 up to 27 years Ekaterina Ivanova will compete against world champions in the struggle for victory in the championship. According to the president of the International Draughts Federation (IDF) Vladimir Langin, the holding of the jubilee World Draughts-64 Championship 2017 is rightly entrusted to the world’s draughts capital St. Petersburg and will serve as another step in the development and promotion of this intellectual sport in the world. The World Championship in St. Petersburg is a jubilee – the 30th for men and the 15th for women. The world’s strongest players from forty-five countries, representing 4 continents: Europe, Asia, Africa and America, will take part in competitions. The championship traditionally will be held in three programs: Blitz, Rapid and classic. I am glad to welcome the participants, organizers and guests of the World Draughts-64 Championship among men and women! Draughts are one of the most popular and respected sports. He combines in itself art, science and sharp logic. The venue for the World Championship 2017 was St. Petersburg – a recognized world draughts center. In different years Leningrad-Petersburg intellectuals won the titles of champions of the World, Europe, the USSR and Russia. The northern capital is famous for its rich sports traditions. 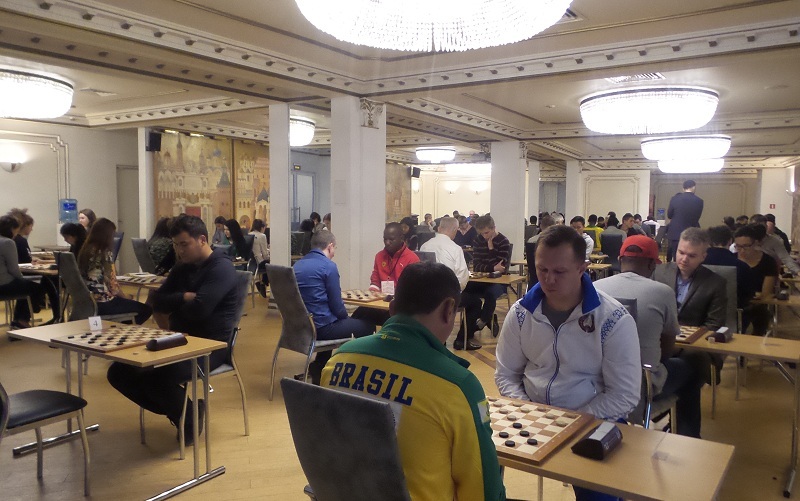 On the city sites regularly held tournaments of the highest international level. I am sure that the current competitions will be held in an honest and uncompromising struggle and will promote the popularization of this beautiful sport. I wish all participants of the championship creative finds, perseverance in achieving the goal, bright victories and achievements! Draughts are an ancient intellectual game, which has more than 3,500-year history. Draughts on the traditional 64-cell board are present practically in all countries of the world and are actively developing. Every year, the number of countries participating in our events, various tournaments and their participants, the level of competition is growing. The World Championship in St. Petersburg is the jubilee – it is the 30th for men and the 15th for women. It is no coincidence that the International Draughts Federation (IDF) has entrusted the holding of this jubilee championship to the world’s draughts capital – St. Petersburg, a city with rich draughts traditions and extensive experience in holding of draughts competitions on the highest level. Draughts were included in the Assembly of Peter I. Draughts movement in Russia was born exactly in St. Petersburg, the first book for draughts was appeared. World Draughts championships 2011, 2013 and 2015, which were held at a high level in St. Petersburg, made a great contribution to the history of draughts sport and served as a huge impetus for the development and promotion of draughts on a traditional 64-cell board throughout the world. I am confident that the jubilee World Championship 2017 will be held in an exciting, fascinating struggle and new stars will shine on the draughts sky! And, of course, the participants of the championship will have an unforgettable impression of staying in our glorious city. Welcome to St. Petersburg – one of the most beautiful cities in the world! I wish sports and creative successes for all! 1.1. General management of the World Draughts-64 Championship 2017 among men and women, hereinafter competitions, is carried out by the International Draughts Federation (IDF), hereinafter International Draughts Federation, and Organizing Committee with the support of the federal and regional executive authorities of the Russian Federation in the field of physical culture and sports. 1.2. Direct leadership of the competitions is assigned to the panel of arbiters approved by International Draughts Federation. Competitions are held from 19th October (arrival day) till 29th October (departure day) 2017 at the hotel “Moscow ****” in St. Petersburg (Russia), Sq. Alexander Nevsky, 2. Hotel website www.hotel-moscow.ru. 3.3.1. Blitz program (International/Russian version). 3.3.2. Rapid program (Brazilian version). 3.3.3. Classic program (International/Russian version). 4.1. To participate in the competitions are allowed players of national federations – members of the International Draughts Federation. ♦ two participants – by the decision of the International Draughts Federation. ♦ two participants from hosting city of St. Petersburg – by the decision of the International Draughts Federation. 4.5. Participants allowed to the World Championships among men and women are eligible to participate in all three programs. 4.6. To participate in the competitions are allowed only participants who did not take part in illegitimate competition, conducted other organizations and not approved by IDF. Participants must not have disciplinary sanctions IDF. Competitions are held on a mixed system. The preliminary stage is held on the Swiss system in 7-9 rounds, according to the system of micro-matches from two games. Participants, who took 1-4 places in preliminary stage, play further in the semi-final and final two micro-matches in each competition. In the semi-finals play pairs of 1-4, 2-3. From each pair to the final comes a player who won on the basis of two micro-matches. In the case of a draw in two micro-matches, to the final comes the player who took the higher place in the preliminary stage. In the final games for the 1st and 3rd place winner is the player who has won on the basis of two micro-matches. In the case of a draw in two micro-matches, the winner is the player who took the higher place in the preliminary stage. ♦ Blitz program: 3’+2″ till the end of the game for each participant. ♦ Rapid program: 7’+5″ till the end of the game for each participant. ♦ Rapid program: 5’+3″ till the end of the game for each participant. Competitions are held on a mixed system. All competitions are held on a system of micro-matches from two games. The preliminary stage is held on the Swiss system in 8 rounds. Then the first 16 people are divided into two groups with 8 players (play 1-8, 2-7, 3-6, 4-5, 9-16, 10-15, etc.). It is played three rounds: ¼ finals, semi-finals and final. In the play-offs, the game goes to the victory without taking into account the previously accumulated points. In the case of a draw, additional matches are played. As a result of the ¼ finals in the semi-finals play pairs 1-4, 2-3, 5-8, 6-7, etc. Participants in the semi-final receive the numbers depending of the higher place in the preliminary stage. Participants, who took 17th place and lower, play additional two rounds by the Swiss system or play-offs, depending on the number of participants. 45’+10″ till the end of the game for each participant. The break between games is five minutes. Game record is obligatory for all participants. One micro-match with time control 30’+10″ till the end of the game for each participant. Color in the first game of the micro-match is determined by lot. If there is a draw in the first micro-match – one micro-match with time control 5’+ 3″ till the end of the game for each participant. Color in the first game of the micro-match is determined by lot. If there is a draw in the second micro-match – one micro-match with time control: white 5’+3″ for two games till the end of the micro-match, black 3’+3″ for two games till the end of the micro-match, in the case of a draw, black wins. The color in the first game of the micro-match is chosen by the participant who took the higher place in the preliminary stage. ♦ for women – with the draw of moves according to the official table (150 positions), approved on 05.05.2016. ♦ match up to the first victory with a shorter time controls: a classic game – 5’+3” till the end of the game for each participant; in the blitz and rapid programs – 3’+2” till the end of the game for each participant. – 6 and 7-pieces endings – 60 moves. – if a player having three kings, two kings and one man, one king and two men against one enemy king, located on the long diagonal, his 5th move will not take enemy king. – if a player having two kings, one king and man, one king against enemy king to their 5th move will not take enemy king. ♦ protests are served in the panel of judges for half an hour after the end of the round, with a protest bail in the sum of 100 Euro. If the protest is upheld the deposit is returned. ♦ after specified in the competition regulations deadline, protests are not accepted and are not considered. Any protests after the specified period are considered as incorrect behavior with the application of sanctions in accordance with the Code of Ethics. 8.1. Participants are required to know the Rules of the game and competition in draughts-64. 8.2. Participants must comply with the Regulations of the competition. 8.3. Participants must comply with the Code of Ethics. 8.4. If the participant or member of a his delegation violates during the competition the Regulations of competition and the Code of Ethics, upon the decision of the Appeals Jury, the player may be sanctioned in accordance with the Code of Ethics. 8.5. Participants must to comply with the dress code – to participate in competitions in the sports form, or in clothing, corresponding to the rank of the competition; and also to have clothes for formal events (suit and light shirt for men, trouser suit or dress for women). 8.6. Participants must be present at the opening and closing ceremonies of the competition in compliance with the dress code. In the absence of the closing ceremony, participants are deprived of the official awards. Awards are not sent and are not transmitted. 9.1. In Classic program winners of World Draughts-64 Championships among men and women are awarded the title of «World Draughts-64 Champion 2017». They are awarded with cups, medals and official diplomas. The participants who took second and third places among men and women are awarded respectively with cups, medals and official diplomas. All participants are awarded memorable diplomas. 9.2. In Rapid program winners of World Draughts-64 Championships among men and women are awarded the title of «World Draughts-64 Champion 2017 in Rapid». They are awarded with cups, medals and official diplomas. 9.3. In Blitz program winners of World Draughts-64 Championships among men and women are awarded the title of «World Draughts-64 Champion 2017 in Blitz». They are awarded with cups, medals and official diplomas. 9.4. As a result of the competition, the best players of Asia, Africa and America will be determined. 9.5. The prize fund of the championship will be announced additionally. The distribution of prizes will be on separate regulations. The tournament fees must be transferred to the account of the International Draughts Federation no later than October 10, 2017 or paid in cash to the credentials committee on the day of registration October 19, 2017. In case of bank transfer payment receipt must be presented to the credentials committee. Participants who have not paid the tournament fee before the end of registration 19.10.2017 will not be allowed to competitions. 10.2.1. Financing the holding of the World Draughts-64 Championships 2017 among men and women – from the budget and attracted funds of the organizing country and directly host city. Accommodation and meals are provided only for the players from the national federations – members of the International Draughts Federation, which have not debt to the IDF and which sent preliminary application for participation before March 15, 2017. Players must comply with the requirements of item 4.6. – one participant both for men and women from each federation in accordance with item 10.2.2. The costs of their visa, travel and tournament fee, as well as all costs of the other participants are paid by sending organizations (visas, travel, meals, accommodation and tournament fee). Participants who provide accommodation and meals by the organizers are required to participate in all three program of championship: classic, blitz and rapid. Accommodation and meals of all participants, members of delegations, coaches and accompanying in the official hotel from October 19 to October 29 is mandatory! The package for accommodation in 2-bed rooms and three meals a day (buffet) from October 19 (lunch) to October 29 (breakfast) is 29,000 rubles per person (Approximately $ 490 for package). 10.2.4. The costs of the competition. Organizers provide costs for renting of gaming premises, opening and closing ceremonies, computer support and information support, transportation costs, expenses for making memorable and reward attributes, information and advertising materials, printing products; rewarding; payment for the work of the arbiters, technical and service staff; medical care. Participants will not be allowed to competitions on applications after the deadline. for the countries-members of Schengen Agreement – not later than August 18, 2017.
for countries – not members of the Schengen Agreement – no later than August 10, 2017. In the application for visas, it is necessary to indicate the dates of arrival and departure, the status (player, coach, member of delegation, accompanying), surname and name as in the passport, date of birth, passport number, date of issue, date of expiry. For countries – not members of the Schengen Agreement it is necessary to send in addition a scan of the passport. Hotel “Moscow” is located in the city center on the Neva embankment near Nevsky Prospekt. In the hotel building there is a metro station “Alexander Nevsky Square”. Excellent transport links allow you to reach the main historical sights of St. Petersburg: Palace Embankment, Hermitage, Admiralty, Kazan Cathedral, Russian Museum in 15-20 minutes. From the windows of the hotel rooms you can see the architectural ensemble of the XVIII century – the Alexander Nevsky Lavra and the Neva. In the period of white nights from the windows of the hotel you can watch the divorce of the Alexander Nevsky Bridge.